So it is inching its way up to 70 degrees today. That's big, HUGE excitement for me!! Although the only pair of capri pants I have handy (as in not packed away in plastic bins in storage downstairs) are an old pair of jean capris. And as I am sitting here looking down at my legs, I realize these jeans have had it. Time for new jeans I guess. Do you have a favorite, go-to denim brand? I snapped this pic while in Tar-jay last week. 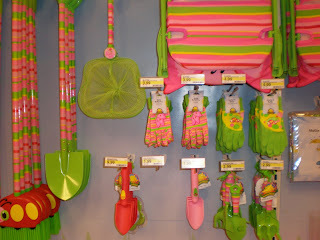 It's the kid gardening section and it is totally pink-and-green-a-licious! Oh yippee- I can't wait for summer gardening and fresh t'maters! I think I may have to start gardening and get some of those gloves... Oh, I just bought a pair of Not My Daughter's jeans... not super preppy, but they are nice for going out... AND come in petite sizes. Thanks for reading my blog and commenting. Pink and green....my favorites! I either get the Lilly Pulitzer jeans on ebay or at the warehouse sale and have them hemmed. Or, I get them at black house/white market and have to get them hemmed as well. But, boy, jeans are sure hard to shop for. Good luck! Too funny! I saw this super-cute display a while back and thought it was totally blog-worthy! It's Hip To Be Green, Lady! The South is Moving North!